Performers include: Dennis Franz, David Caruso, James McDaniel, Sherry Stringfield, Amy Brenneman, Nicholas Turturro, Gordon Clapp, Sharon Lawrence, Gail O’Grady, Jimmy Smits, Kim Delaney, Bill Brochtrup, Justine Miceli, Andrea Thompson, Rick Schroder, Henry Simmons, John F. O’Donohue, Garcelle Beauvais-Nilon, Charlotte Ross, Esai Morales, Mark-Paul Gosselaar, Jacqueline Obradors, Currie Graham, and Bonnie Somerville. This police drama is set in the 15th precinct of the New York Police Department and revolves around cases in Manhattan. At the heart of the series is the tough, temperamental, but sensitive Detective Andy Sipowicz (Dennis Franz) and his brilliant partner Detective John Kelly (David Caruso). When Kelly meets cop Janice Licalsi (Amy Brennenman), he loses both his heart and his career after trying to keep a mob-connected murder, that Janice was responsible for, under wraps. When Kelly leaves the force, recently-widowed Detective Bobby Simone (Jimmy Smits) takes his place and, in spite of being the opposite of Sipowicz, the two become friends. Simone eventually finds a marriage partner in fellow Detective Diane Russell (Kim Delaney). Andy finds happiness again, too, with District Attorney Sylvia Costas (Sharon Lawrence) and together, they have a son named Theo (Austin Majors). When Simone dies of heart failure both Russell and Sipowicz grieve the loss to their own lives. Russell ends up seeking comfort and a relationship with Simone’s replacement, confident and highly-capable Detective Danny Sorenson (Rick Schroder). The hardened police officers of the NYPD aren’t strangers to tragedy and Sipowicz is no exception as loses his wife Sylvia and his adult son from his first marriage, Andy Jr. (Michael DeLuise). He also loses abother partner as Sorenson disappears and is later found to have been killed by a mob hitman. 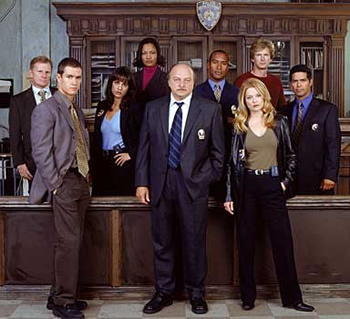 But Sipowicz keeps it together for his little son and develops new relationships with Detective Connie McDowell (Charoltte Ross), administrative aide John Irvin (Bill Brochtrup), and finds a new partner in John Clark Jr. (Mark-Paul Gosselaar), who has a complicated relationship with his detective father. Created by Steven Bochco (co-creator of Hill Street Blues, L.A. Law), this groundbreaking series billed as televisions first “R-rated” scripted drama never failed to push boundaries or pack an emotional punch.